My book The Linux Philosophy for SysAdmins is now available in hardcopy (softcover) at Amazon. Hardcopy is now available at Apress, Amazon, and Barnes and Noble. The ebook versions are now available at Apress in multiple formats including PDF, and the Kindle version is at Amazon. 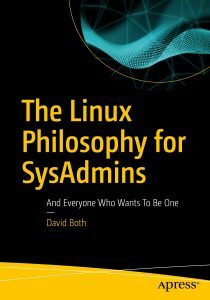 The hard copies of my book, The Linux Philosophy for SysAdmins, are now available at Apress and on-line at Barnes & Noble but not yet at Amazon. Amazon is showing availability in February of 2019 but I think it will actually be available sooner. After my post, KDE Komplications, I have noticed some definite improvements in the KDE applications I like to use. I like to use Gwenview image viewer, Krusader file manager, and Konsole terminal emulator. These had all been having problems until I recently installed a new set of updates for Fedora 28. I do not know if this has resolved all of the problems with the KDE desktop but it has definitely resolved all of the problems I was having with those applications. Gwenview no longer crashes and all of the apps now display the correct icons where they showed no icons while the problem existed. For the time being I intend to continue using the Xfce desktop and the xfce4-terminal because they are fine applications in themselves and give me the features I need and most that I like. I will probably continue to switch between file managers as I have a different favorite for many of the tasks I do. I like Krusader when I need lots of directories open using both tabs and twin panels. I like XFE because it has a great sidebar that shows the directory tree and makes navigation to distant places easy. I also like the text-based Midnight Commander (mc) for use in terminal sessions. I find Thunar especially good for browsing with thumbnails to locate specific images or documents and it has a good sidebar. At some point soon I will try the KDE desktop again and see if it still crashes and causes long, resource-eating core dumps. For more information and a link to a complete book description, see the post on my personal web site. I recently purchased a new ASUS TUF X299 motherboard and an Intel i9 processor with 16 cores (32 CPUs / threads). The processor runs at a default of 2.8 GHz but is actually capable of being overclocked to much higher speeds on this Fedora 27 box. I really don’t care about getting the last bit of performance out of my computer; I really would rather have reliability than maximum speed. But I do want a bit more than 2.8GHz. After fussing with the system for a few days and not getting any stable results, I decided that it would be interesting to try reinstalling fedora from scratch. For the last several versions I have been doing upgrades rather than reinstalls, so I thought I might as well try the reinstall. That did work for me and I was able to get to my target of 50% overclocking without any trouble. The bottom line in this case is that Fedora should be installed from scratch on a host in order to ensure best performance from these newer and very powerful CPUs. At the end of October, I signed a contract for a book deal with Apress publishing. 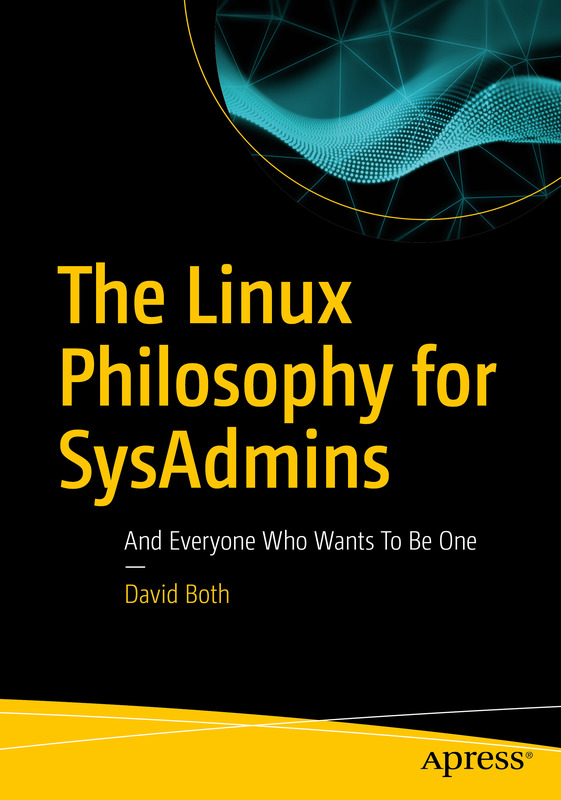 My book is tentatively titled, “The Linux Philosophy for System Administrators.” My intention is for it to be the book that I wish I had when I started as a System Administrator (SysAdmin) many years ago. I have made a significant change in the look of the Linux DataBook web site. I found This new “Magazine-Basic” theme on the free WordPress themes site. After making a few simple configuration changes to the theme, installing my Linux header image, and a couple other minor changes, it is ready for use. This new theme is clean, easy to read, and easy for me to work with as the admin and sole author. I like its simplicity, and it also handles code segments better than my previous theme so that they are easier to read and don’t run off the right edge. Fedora 27 was officially released yesterday, November 14, 2017. Today I downloaded it and upgraded one of my VMs from Fedora 25 to Fedora 27. That went very well, so I upgraded my main workstation. That went well, too and I am using that workstation to write this post. It took about 3 hours to do the upgrade using the dnf upgrade plugin. I have written a script that does all the work so I just run that and check up on it later. This upgrade procedure has worked well for the last four version upgrades.